I know I normally rave about wine, but we've moved locals and I haven't found a winery. Yet. Give me time, I will find something I'm sure. Nothing to replace Ingleside, but something that will be okay. Besides I know my favorite winery can ship to me. And recently a friend asked me if I'd opened a bottle of my favorite wine. Seeing as I only have one bottle of Ingleside Rosato di Sangiovese I'm saving it for when my buddy John is over so he can try it with us. This leads me to the picture above. Big ain't it? 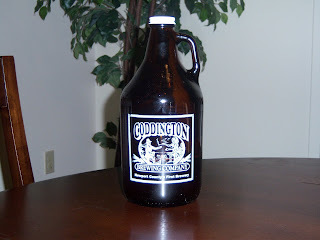 Coddington Brewery is just across the way from us and they have some tasty beer. Yeah Steve I'm quoting you here. We've fallen in love with some of there beers. This can lead to trouble for us. But at least we can stumble home. So as a reward for us tonight, hey it's been a rough week, I went out and got us something called a growler. It's sixty-four ounces of their micro-brew. We chose the Vienna Lager. If you click on the title you will be taken to Coddington Brewery's website. 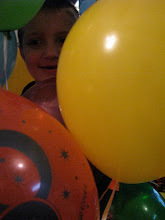 And hey! Feel free to leave comments.